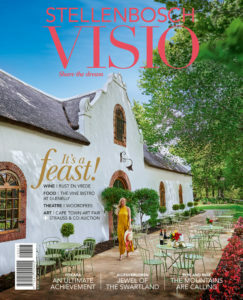 Stellenbosch Visio is a lifestyle hub serving residents, visitors, as well as its working population with insider’s news, events and features on this special place. Stay up to date with the latest developments through Stellenbosch Visio’s e-newsletter, Facebook and Twitter touch points as well as our quarterly magazine – available through selected news agents and subscriptions (click here to sign-up or call 0860 100 204). We’d love to hear from you – drop us an e-mail here. Stellenbosch Visio carries limited advertising, drop us an e-mail for more information or contact us on +021 447 6094.